Blackheads are the bain of our existance so here’s everything you need to get them cleared out in the privacy of your own bathroom mirror. For the best results, it’s recommended to extract blackheads and clogged pores immediately after a shower since the skin temperature has been raised. This will soften the hardened oil within the pore, making for easier extractions. After showering or washing face, apply a thin layer of the heaviest moisturizer you have available to the area you’re wanting to remove blackheads and clogged pores. By using a rich moisturizer, it will create a temporary occlusive seal to keep the heat trapped in the skin, which for extractions purposes is necessary. Cover the area with cellophane/plastic wrap and apply the first hot, damp washcloth. Then, get the second washcloth nice and hot and apply it over the other one. The top one will help the one below (that’s touching the skin) retain its heat longer. For safe extractions and the easiest removal, it’s important to have the skin as soft as possible. Remove the plastic and keep the skin moist by applying a bit more moisturizer. More than likely, it will have wiped off on to the washcloth. How to extract using your fingers: Wrap a tissue around each forefinger and gently squeeze to extract blackheads and clogged pores. The goal with squeezing is to avoid positioning the fingers too close as this won’t allow the blackhead to come out. Widen them out a bit so that the blackhead will be extracted easier from the deeper level of the skin. To avoid creating squeeze marks, go easy and be sure to relocate the position of your fingers. For example, position fingers at 3:00 and 9:00 and then 5:00 and then 10:00, 2:00 and 7:00. My general rule is, three strikes and you’re out. Meaning, if it doesn’t come out after three tries, don’t do it any longer or you’ll risk damaging the skin or potentially breaking a capillary. How to use an extractor tool: There are blackhead extractor tools available online. I like one that has a curved tip. If you’re not confident that your fingers will do the trick, then consider using one of these. As an esthetician, my fingers are trained well, but this tool might make it easier for you. Hold the tweezers in one hand and place the open tips on both sides of the blackhead you plan to extract. With the tweezer body perpendicular to the area to be extracted (curved part of tips in contact with the skin) and using the round, curved ends, gently press on each side of the blackhead until it begins to release. Apply slow and even pressure and once you are able to, lightly pinch the tweezers and pull the blacked out from the skin to extract it. If the blackhead does not release easily, do not continue to attempt the extraction. We’re going for what I like to call, responsible squeezing. When finished, wipe the skin with an alcohol-free toner and then apply a cooling, anti-redness, anti-bacterial gel mask like Rapid Response Detox Masque to reduce any irritation and clean out the pores further. Note: Do not use any acid-based products for at least 24 hours after manual extractions. So there you go. A safe and effective way to extract blackheads and clogged pores for those who wish to do it themselves in the privacy of their home. 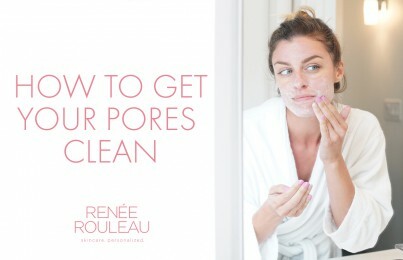 Note: Here’s why pore cleaning strips don’t work. How can I prevent blackheads from coming back? The truth is, blackheads WILL slowly re-appear over time (unfortunately! ), so it’s important to use the right type of products for prevention. Use products with salicylic acid to keep pores clean. Once the pores are clean, it’s important to incorporate products into your routine that use acids, such as AHA’s and BHA’s to absorb directly into the pores and keep them cleaned out, as well as preventing the oil from filling back up so quickly. Skin care products with blackhead-clearing acids include cleansers (see AHA/BHA Blemish Control Cleanser), Beta Hydroxy (BHA) serums (like Pore + Wrinkle Perfecting Serum and BHA Clarifying Serum) and at-home pore cleaning peels (try Triple Berry Smoothing Peel) and masks (try Rapid Response Detox Masque). Be sure the products are gentle and do not contain SD alcohol 40 or denatured alcohol. Prevent the oil from oxidizing. 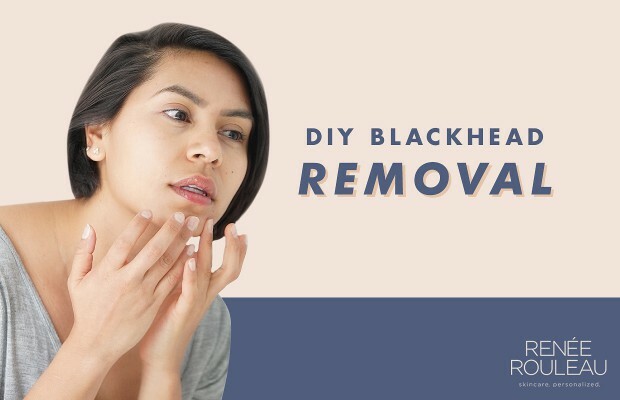 A blackhead is simply oil that has oxidized and turned black, so if you can prevent the oil from oxidizing, the oil will not turn black (or at least as quickly). Antioxidants used in skin care products have many benefits for preventing environmental skin damage, but one surprising benefit is their ability to prevent oil from oxidizing which leads to the black color in blackheads. Here’s an experiment I did to show how antioxidants prevent oxidation. The product that is best for preventing blackheads is Vitamin C & E Treatment since it uses three forms of stable, no-sting Vitamin C.
Speaking of doing extractions yourself at home, not all things are meant to do at home. Here are some at-home skincare trends that I DON’T recommend you try. can we use a moisturizer that has mineral oil? 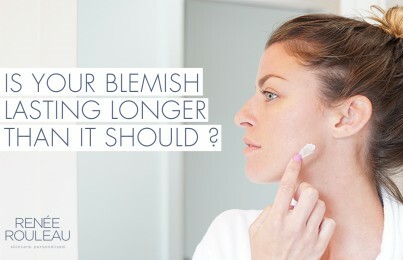 or is it going to clog the pores?